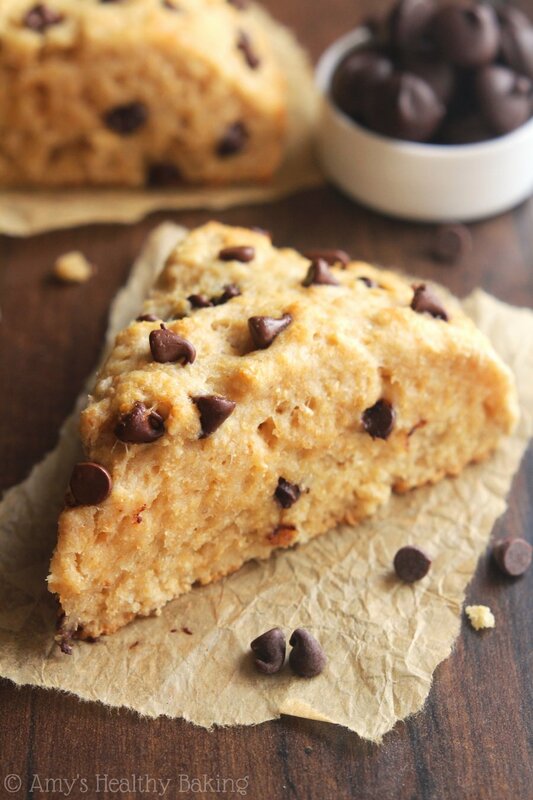 Tender scones with the same almond, coconut & chocolate flavors as the popular candy bar. But they’re much healthier with no refined sugar or artificial ingredients! Two weekends ago while visiting my parents, my mom came home from running errands with a gleam in her eye. “Want to go to an open house?” she asked excitedly. “No way—it’s open today? ?” came my surprised response. “Yes!” Mom exclaimed, and two minutes later, I sat buckled into the passenger seat of her car as she eased back down the driveway. To the house I grew up in. As the first owners of that modest house, my parents bought it a few years before I was born, but the summer I turned 10, my family moved across town to a larger home with a spacious backyard on a quieter cul-de-sac. With ample space for kids and dogs to run around—plus a detached workshop for my dad’s woodworking hobby—none of us ever regretted moving. And miraculously, nearly everything still looked the same. The brick fireplace, the carpeted stairs and banisters, the tiny bedrooms, the special kitchen cabinets crafts by Dad. But the second owners had still redone a few things, like updating the kitchen appliances and adding in a laminate hardwood floor. Mom and I wandered around, soaking in the familiar parts and new twists, all while taking pictures to show my dad and brother when we returned. As we walked down the driveway and turned around for one last glance, we both agreed—we were glad we went! 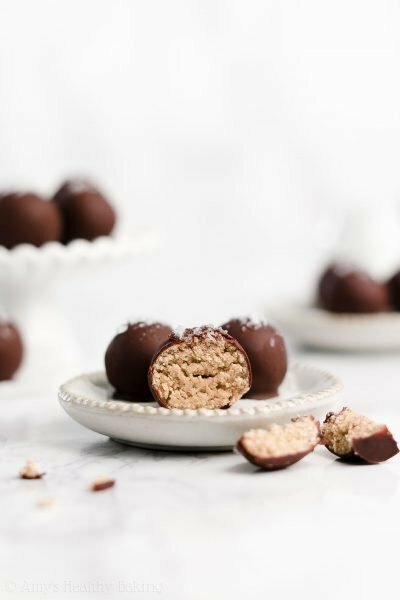 Similar to what happened to my childhood home, I gave a familiar flavor profile an updated twist: I turned candy bars into a healthy breakfast! 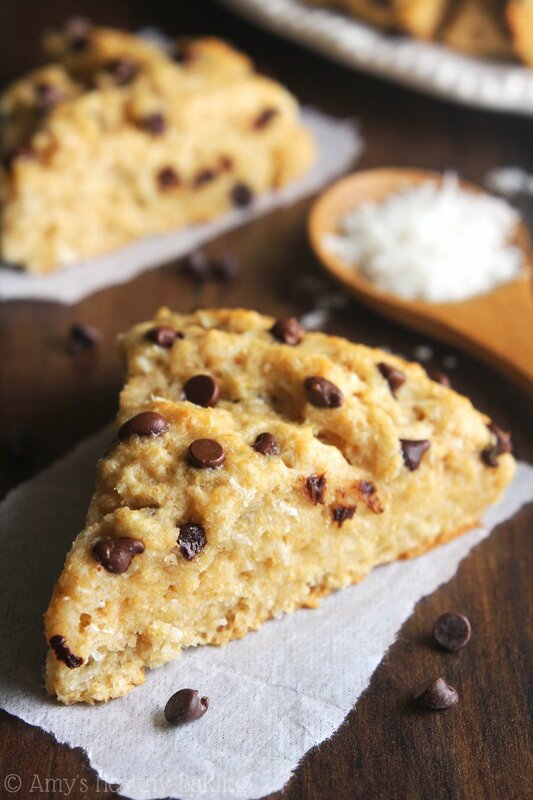 These Clean Almond Joy Scones have the same nutty, coconutty, chocolaty taste as their namesake but none of the refined sugar or artificial ingredients. Besides, who can resist chocolate for breakfast?? To make these pastries clean eating friendly, I added in white whole wheat flour instead of all-purpose. It has a lighter texture compared to regular whole wheat flour and a more subtle wheaty taste. However, both regular and whole wheat pastry flour would both work if you don’t usually buy the white version. Instead of sugar, these scones are sweetened with maple syrup! The real, pure kind—not the artificial stuff sold in squeeze bottles. Only the best of the best, straight from the trees, for these scones! 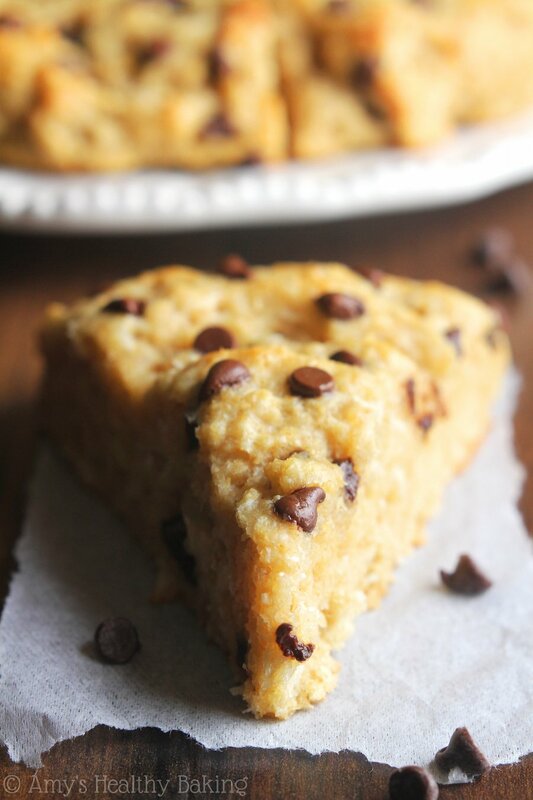 Since I prefer my scones on the not-so-sweet side (no need to induce cavities at breakfast! ), we only need a few tablespoons. Honey or agave work too; just use whatever you usually have on hand. Although most scones are rather indulgent and laden with butter and heavy cream, this healthier recipe only uses 2 tablespoons of butter! The rest of their tender texture comes from my secret weapon: Greek yogurt. Greek yogurt adds all of the moisture of butter for a fraction of the calories, and it gives the scones a little protein boost too! And now for the most important part… The candy bar flavor! We’ll use almond extract for the nutty flavor, shredded unsweetened coconut, and lots of mini chocolate chips. 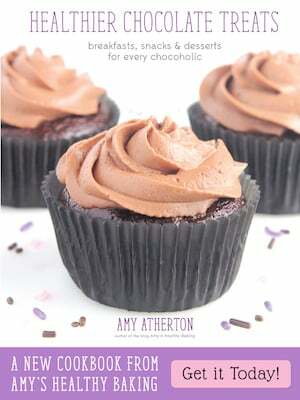 I prefer more chocolate than coconut (it’s why I’m writing a chocolate cookbook! ), but feel free to tweak the amounts of each to suit your tastes. Want to see how it all comes together? Then watch my short video! Now who’s hungry for breakfast? 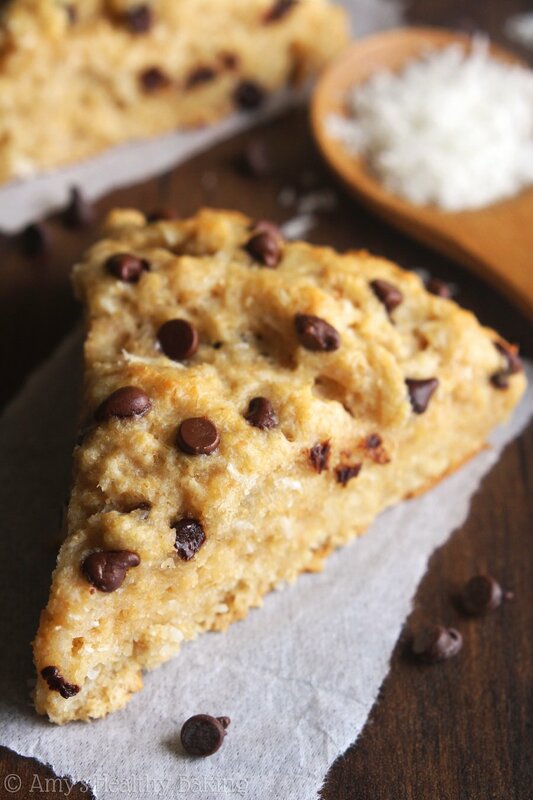 These tender scones have the same flavor as the popular candy bar—but none of the refined sugar or artificial ingredients! Store any leftovers in an airtight container on the counter for up to 2 days or in the refrigerator for up to 5 days. In a medium bowl, whisk together the flour, baking powder, salt, and coconut. Cut in the butter with a pastry cutter or the back of a fork until the mixture resembles fine crumbs. Make a well in the center. 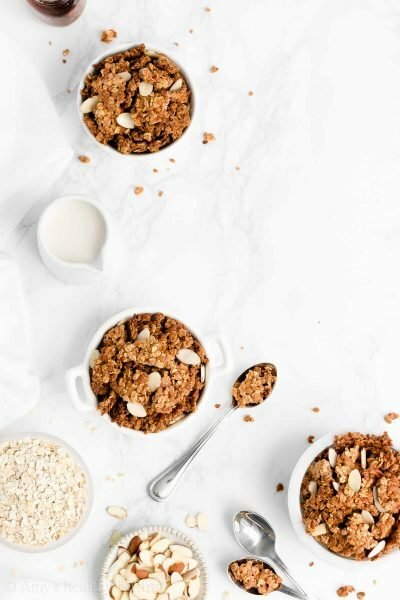 Stir in the Greek yogurt, maple syrup, 2 tablespoons of milk, and almond extract. 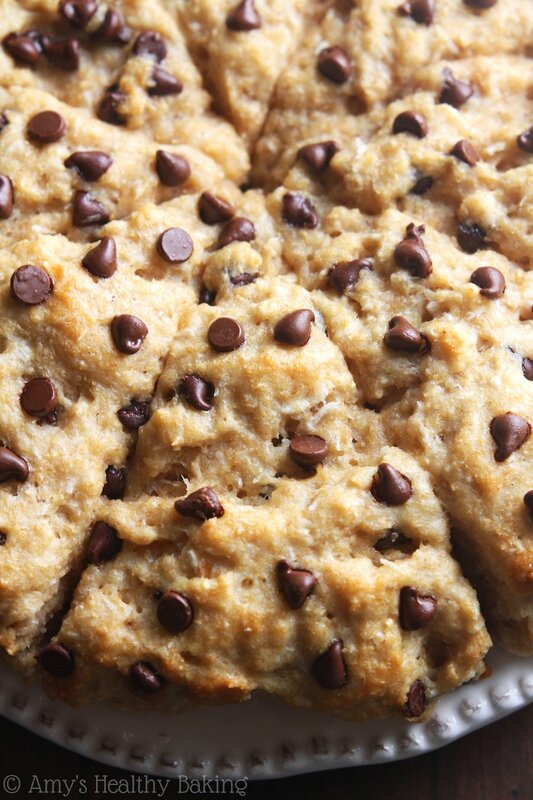 Fold in 1½ tablespoons of chocolate chips. Shape the dough into a ¾” tall circle on the prepared baking sheet, and brush with the remaining milk. Slice the circle into 8 triangular segments with a sharp knife. Gently press the remaining chocolate chips into the tops. Bake at 425°F for 17-20 minutes, or until the tops are lightly golden. Cool on the pan for 5 minutes before transferring to a wire rack. Notes: Regular whole wheat flour, whole wheat pastry flour, and all-purpose flour may all be substituted. 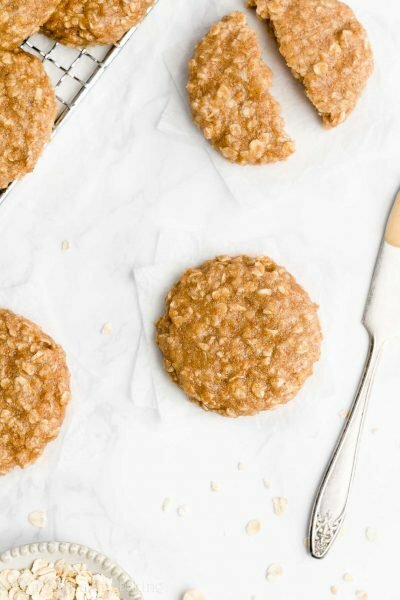 For a gluten-free version, I recommend the following blend: 1 cup (120g) millet flour, ¼ cup (30g) tapioca flour, ¼ cup (30g) brown rice flour, and 1 teaspoon xanthan gum. Hi. I am really curious about this recipe. Scones is one of the things I always wanted to make but never did, mostly because I always thought they have way too many calories for something you have for breakfast. I think I will try this version. I can leave out the chocolate, can´t I? 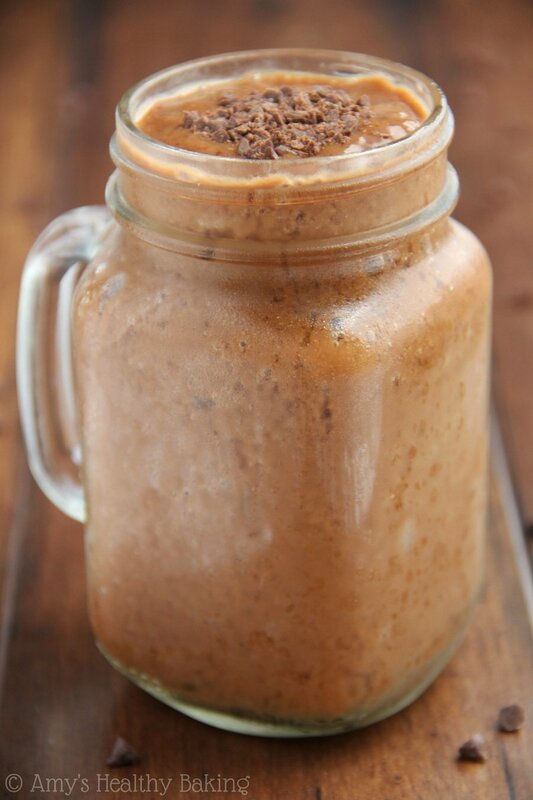 Yes, you can leave out the chocolate Adina! You’re welcome to add in extra coconut to make up for it if you prefer. I hope you enjoy the scones! how can I use coconut flour, for an alternate gluten free recipe? I’m new at baking with gluten free types of flour. This recipe will not work with pure coconut flour; it behaves much differently than any other type of flour. If you’re new to baking with GF flours, I recommend sticking with the blend included in the Notes section beneath the recipe. I hope you enjoy the scones Amy! AWW, how fun!! I often wonder what it would be like if my mom sold the house I grew up/still live in. HA. These scones look simply divine! Thanks Brittany! I love how you still live with your family. I’d be happy living with mine too since we’re such good friends, not just family! First of all, happy belated birthday! You are one of the sweetest, most thoughtful bloggers I’ve met, and I hope you had a fantastic day. Second of all, love this post! Love the scones, love the almond joy, love the video; love it all! 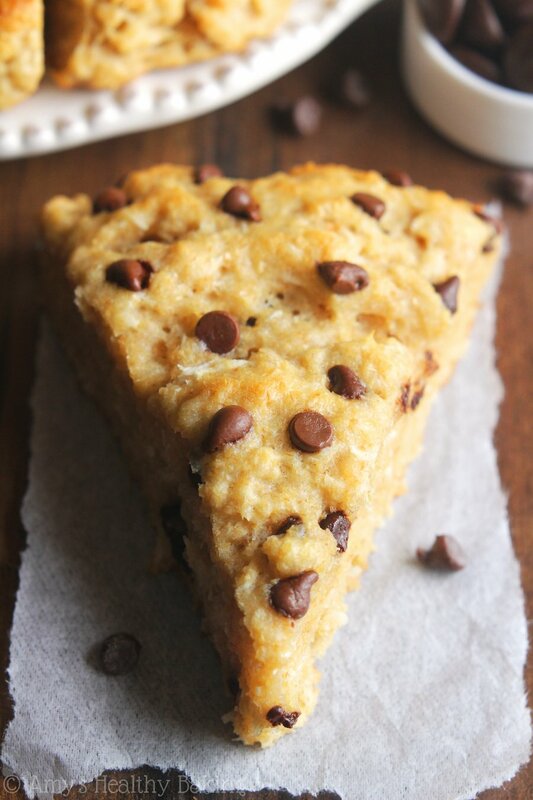 I adore all things coconut and chocolate and scones are my favorite indulgent breakfast. I cannot wait to try! You’re so sweet Mary Frances — thank you!! ♥ I hope you enjoy the scones if you try them! Hello Amy! 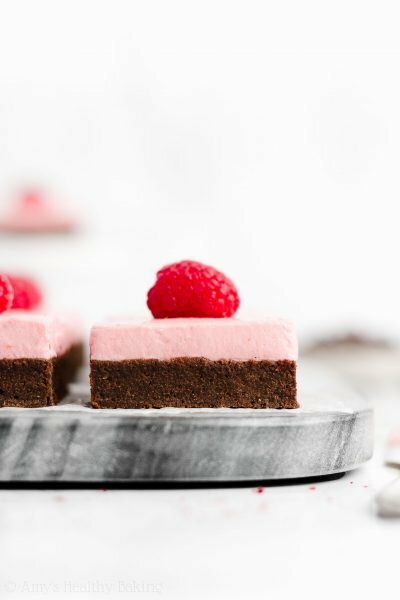 Can I use almond flour in this recipe? Almond flour may work, although I haven’t tried it and can’t guarantee the results, but you may want to add in xanthan gum too to ensure the scones’ texture is as close as possible to the original recipe. (See the Notes section beneath the recipe for how much.) I hope you enjoy the scones Becky! That sounds like such a special childhood home Colleen! My grandfather also grew up on a farm (in Colorado), and even though nobody has lived there for decades, he still kept the house and land so that everyone in the family could stop by and reminisce whenever they wanted. Now that Grandpa is getting so old, they’re in the process of selling the farm… There’s just something extremely special about farms, don’t you think? And what you said about childhood homes and memories is so very true — thank you for sharing that! 1. Can using sweetened shredded coconut work? 2. In the ingredients list, you say we need almond extract, but in the instructions, you mention vanilla extract. Which one is correct? Are both used in the recipe? Yes, sweetened shredded coconut will work! And thank you so much for catching that typo — I just updated the recipe. You just need almond extract! 🙂 I can’t wait to hear what you think of the cookies Diana! I made these today, and I really enjoyed them! I used an extra tablespoon of maple syrup and cut back on the milk in order to make it sweeter. 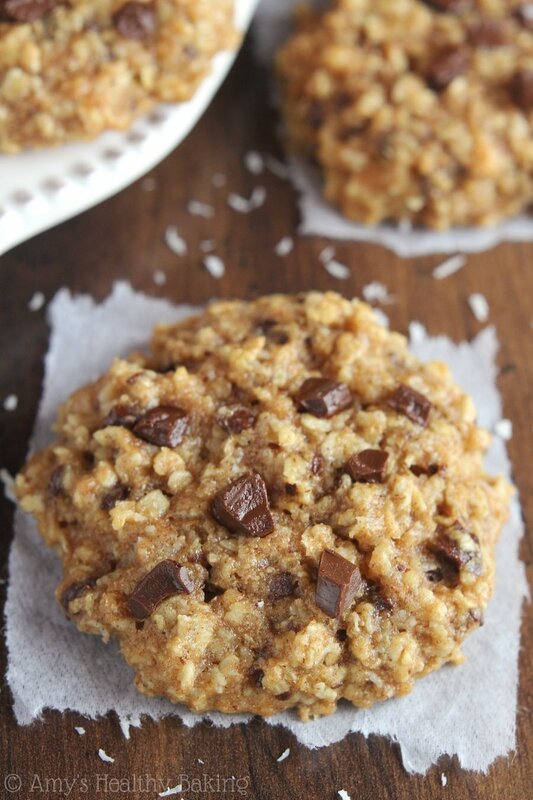 I also added some extra mini chocolate chips and sweetened coconut. The outside got a bit crisp while the inside was still a bit underdone, but since this recipe had no eggs, that was fine by me – I really liked the texture. 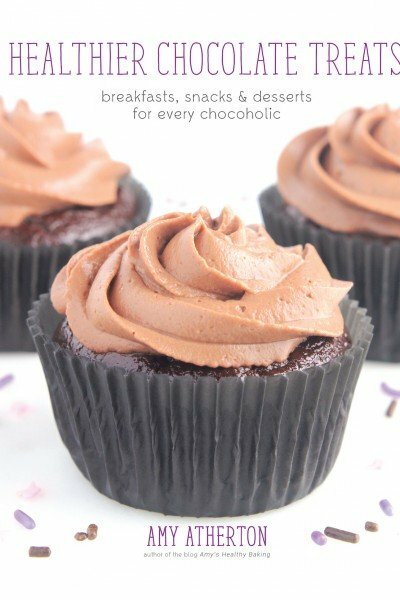 Very yummy recipe! That was such a lovely way of incorporating the childhood home story into the recipe. In the beginning I started bookmarking some of your recipes to try at some point but it seems like there’s too many to bookmark. All the recipes are simple and delicious. I’m so glad I found your blog and YouTube channel. You’re so kind Mita — that means SO much to me that you’d think there are too many of my recipes to bookmark. What a huge compliment! I’m honored; thank you! 🙂 I can’t wait to hear what recipe of mine you try next!